Just installed a new water softener and replaced a computer motherboard in a Neutralizer, that corrects pH water balance. 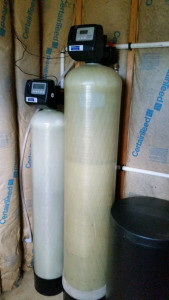 Family in Zirconia NC were having hard water issues so having been established customers for their Neutralizer system that also needed service, they dropped off the bottle of their sample water (FREE TEST). Tested that they had now also hard water issues and a bad What’s a computer motherboard in their Neutralizer we came equipped with a solution. Family is now enjoying fantastic water for the whole.